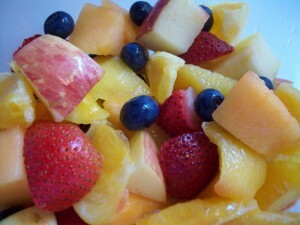 Chilled Fresh Fruit Salad – Refreshing! This is the fresh fruit salad I made yesterday. It’s great to keep in a Tupperware type covered bowl in the fridge ready for a quick snack, but just make sure you do not add banana to the whole batch. If you want to add banana, just add it to what you’re getting ready to eat since bananas turn dark quickly. However, the juices from the other fruits keep the apples from turning dark, so they’re OK the next day. It’s so delicious (not to mention being healthy) that it’s hard not to eat a second serving of it! Click here to see a list of the top 12 fruits & veggies with the most amounts of pesticides. This entry was posted in Health & Nutrition, Recipes &Cooking and tagged fresh fruit salad, healthy snack for kids by Charla. Bookmark the permalink.